This circular ride may be only 30 miles in length but its only one for fit cyclists. It includes the forebodingly named, frighteningly steep, and undeniably challenging Bealach Maim. 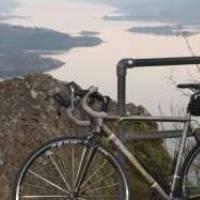 Begin your ride from the Royal an Lochan in Tighnabruaich. It’s a convenient spot from which to depart as there’s a public car park right there and shops nearby if you need to grab some supplies before setting off. Tackling the route anti-clockwise means heading in a north westerly direction on the B8003 out of Tighnabruaich and straight away you are into a big climb. Known locally as the New Road, this spectacular stretch of part single- part double-track highway was originally a logging road that was only made into a public highway in the late 1960s. It is a tough start to the circuit and as with all of the climbs on the route, you are best advised to settle into a gear, a cadence and a breathing rhythm you can sustain rather than attempt to ‘monster’ your way up this first hill. As you climb up and away from the village you will catch some great views of the Kyles of Bute but it’s worth stopping at the National Trust viewpoint just a few miles into the trip to take in what must be one of the finest, yet most easily accessible, views in Scotland. After drinking in that vista, your senses will be engaged in an altogether different way as gravity takes over and helps propel you at great speed – watch out for sheep in the road! – back down to the shores of Loch Riddon. A quiet, flat section at the head of the loch leading into Glendaruel is an opportunity to draw breath and prepare for the mega-climb you are about to face. Where the A8003 meets the A886 you will take a left turn and a quarter of a mile later take another left. This single track B-road is relatively little-used and connects the A886 with the B8000. However, even in a car it is not for the faint-hearted and on a bike it will pose a major challenge to not only your fitness but also your bike handling skills, particularly if you meet on-coming traffic and don’t want to interrupt the climb. According to the Map My Ride website this road climbs from 16m to 321m in 4.6km at an average of 6% and is “arguably the 2nd toughest climb in Scotland, with sections at 20%”. Other references claim different figures but whatever the reality, you will have to dig deep into your reserves of energy and determination if you are to make it to the top without a dab. All that pain will, however, be quickly forgotten as you cruise down the other side with minimum effort and maximum self-satisfaction. The view of Loch Fyne on this descent is stunning and depending on the state of the tide you may get a fantastic view of Oitir Spit, a shingle bank which stretches over a mile out from the shore and has caught out many a sailor. No doubt some of them have misjudged the depth of water covering the hazard after a visit to the nearby Oystercatcher pub, an option for you if you make a right turn when you pop out at a junction with the B8000. There can be few pubs in Scotland with a more picturesque setting than the Oystercatcher, nestled as it is close to the shore and perfectly situated to watch the sunset over the loch while enjoying a pint of Fyne Ale. 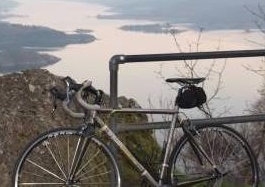 If you immediately turn left at the B8000 junction you will enjoy a good 12 miles or so of undulating B-road which offers views of Loch Fyne but which also cuts inland away from the coast through a surprising variety of landscapes. On the way you will pass though Kilfinan. Once the main settlement in the area, this village gives the Parish its name and boasts a fine 13th-century church. Although much altered from its original form, it contains an 11th-century stone cross, said to have been inspired by the Iona Cross, as well as burial stones and other excellent examples of early Christian stonework, dating as far back as the ninth century. Theres also the Kilfinan Hotel. On the other side of the road is the remains of a large lime kiln, a reminder of how the church and most local structures would have been put together in the days before cement superseded lime. Theres one more big climb before you get to cruise all the way back to Millhouse. This village grew up around a gunpowder works, but a graveyard in the settlement bears witness to just how dangerous an occupation this was. Stop at The Barn, well signposted from the crossroads, for a cup of tea and some mouth-watering home-baked cake before making the final short climb to the golf course above Kames. From here you can freewheel almost all the way back to the Royal an Lochan, where you might want to enjoy your celebratory drink either with a bar meal in the Shinty Bar or some fine-dining in the restaurant.